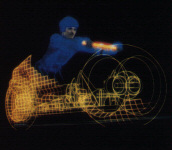 Tron - 20th Anniversary Edition -- Very little is more "obsolyte" than a 20 year old movie featuring computer generated material that has no texture mapping -- because the technique didn't even exist when the film was made! And yet this is still one of the coolest looking films of all time, simply because of how Syd Mead and Jean Mobius contributed to the look. This double DVD set has the movie on the first DVD and the second DVD is filled with storyboards, "making of" material, early concept designs, interviews with those that made the film, and more. Easily worth the price particularly if you've ever met a friend on the street and shouted "Greetings Program!" (yes, I've done this... I'm such a geek!). 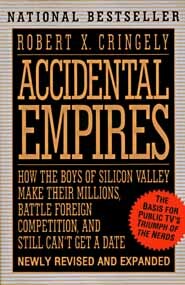 Accidental Empires : How the Boys of Silicon Valley Make Their Millions, Battle Foreign Competition, and Still Can't Get a Date -- I found this to be one of the best books I have read that tells the story of how Apple rose and fell, how IBM managed to completely screw up and hand their billions to Bill Gates, and otherwise chronical the daily insanity that is the "personal computer" industry -- most of it happening within the confines of a small suburban area just outside of San Francisco that most people refer to as "Silicon Valley". This book became the basis for the PBS Specials "Triumph of the Nerds" and was also a reference source for the TNT movie "The Pirates of Silicon Valley". The author of this book, a former writer for Infoworld's "rumors" column, has since movied on to write for the PBS site, with his weekly "I, Cringely" column. If you like his columns, you'll love the book, as his style is both witty and informative. I mean, for years, I thought the author really was Robert X. Cringely -- which is a pseudonym. To this day I don't know his real name. 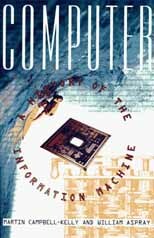 Computer : A History of the Information Machine -- If you're interested in computers older than the Apple //, then this book is for you. Tracing the origins of the modern computer from people who did calculations to Charles Babbage to the first mechanical adding machines to electronic creations using mercury delay lines to ENIAC. Not surprisingly, the book also follows the rise of IBM and NCR, still two of the biggest giants in computing, but it's interesting to note how many other companies have come and gone around these two. The book also touches on the growth of the personal computer industry, Microsoft's rise to dominance, and how society itself is being reshaped by easy access to computers and how the world-wide-web will continue to alter our culture. While not nearly as witty as "Accidental Empires" (see above), this book is filled with an amazing amount of information and I highly recommend it. 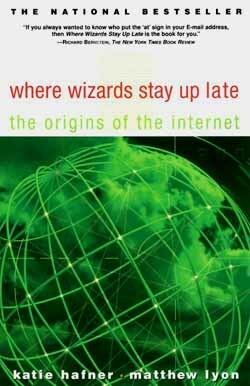 Where Wizards Stay Up Late : The Origins of the Internet -- The "internet" is older than you think it is. Starting with some terminals connected to the Pentagon, the two authors of this book delve deeply into the mysterious world of the packet switched network, the origins of ARPA-net, and a little known think-tank called BBN, which laid the foundation to what we know today as the internet. The book is both surprising in how brilliant people solved difficult problems with simple solutions as well as startling in how greater and more powerful forces didn't think it was going to work at all. You would think that Bell Telephone would have invented packet-switching, but not only did they not, but Bell thought the entire thing was without merit. It's a non-technical read, you don't need to be a wizard to understand it, and what technical details there are, are explained in great detail and with an eye towards making the technical understandable to the layman. Due to the fact that many of the founders of the internet are alive today, the book is filled with interviews and anecdotes about the rush to create something that had never been attmepted before -- which is to make two different computer systems in physically different locations "speak" to one another. Anyone even mildly interested in knowing how this great internet came to be should give this book a read. Plus there's some good pictures in the middle of the book of some of the old hardware used to make the magic happen.